The Philippine Aerial Taxi Company (PATCO) was established as an air shuttle service to and from Manila, Baguio, and Paracale in 1930. On March 18, 1931, it made its first round-trip flight between Manila and Iloilo. By the end of that year, PATCO flew its first scheduled service in response to public demand for passenger flights. 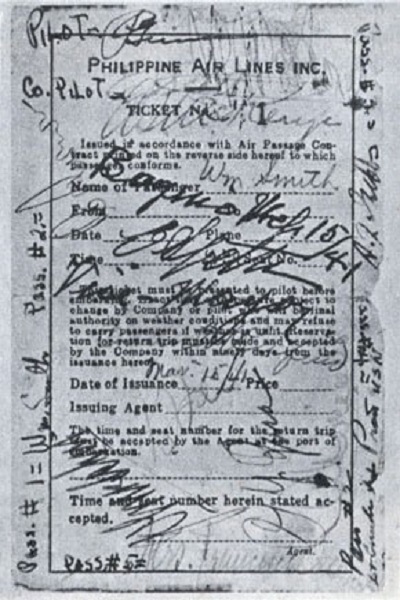 Then, in 1932, it was awarded a contract to carry mail between Manila and Baguio. While PATCO was ironing out plans to fly to the Visayas, the Iloilo-based Lopez family launched the Iloilo–Negros Air Express Company (INAEC). Not long after it was founded, INAEC already made flights to Davao and Cagayan de Oro, while PATCO was still only flying to and from Baguio, Masbate, and Paracale. Next INAEC invested in two Sikorsky S-43 twin-engine amphibians, considered the best aircraft in the Philippines at the time, making it the most advanced airline in the country. Because of heavy losses, PATCO could not keep up with the competition. The company folded in 1939. Meanwhile, Andres Soriano, co-founder of PATCO, was planning to establish another airline. Following the advice of his personal pilot, Paul Ivring Gunn, Soriano spearheaded the launch of Philippine Airways in early 1941. Soriano was appointed operator and general manager of the airline. On March 13, 1941, he changed its name to Philippine Air Lines (PAL). Two days later, PAL’s Beech Model 18 twin-engine plane flew from Nielson Airport in Makati to Baguio City. Gunn and his assistant, Emil Sylvan Scott, commandeered the five-passenger inaugural flight. It signaled PAL’s readiness to compete with INAEC for the Baguio route. Competition between the two intensified as PAL quickly expanded its route system to serve Legaspi, Daet, Naga, Masbate, Tacloban, and Cebu. The airline also transported gold from Baguio and Paracale. With financial backing from the Philippine government, PAL purchased PATCO’s franchise in mid-1941. At the same time, PAL ordered additional aircraft to be used for flights between Manila and southern Philippines as well as between Manila and Hong Kong. Unfortunately, these aircraft were to be delivered in December 1941, the same month World War II started.